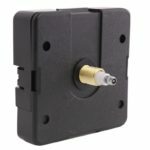 Clock movements are available in a wide range of sizes. There are a few important measurements you will need to have when ordering a clock movement, to ensure you get the right one to fit your application. You’ll want to make sure that the clock movements thread length is long enough to fit through the thickness of the material you are mounting the movement to (clock dial material could be a simple clock face or decorative items like a wood plaque). When using a glass front on your clock keep in mind the total shaft length (total post length). 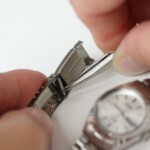 You’ll want to make sure there is enough room underneath the glass to fit the total shaft length including its minute hand cap nut or if you’re adding a second hand. 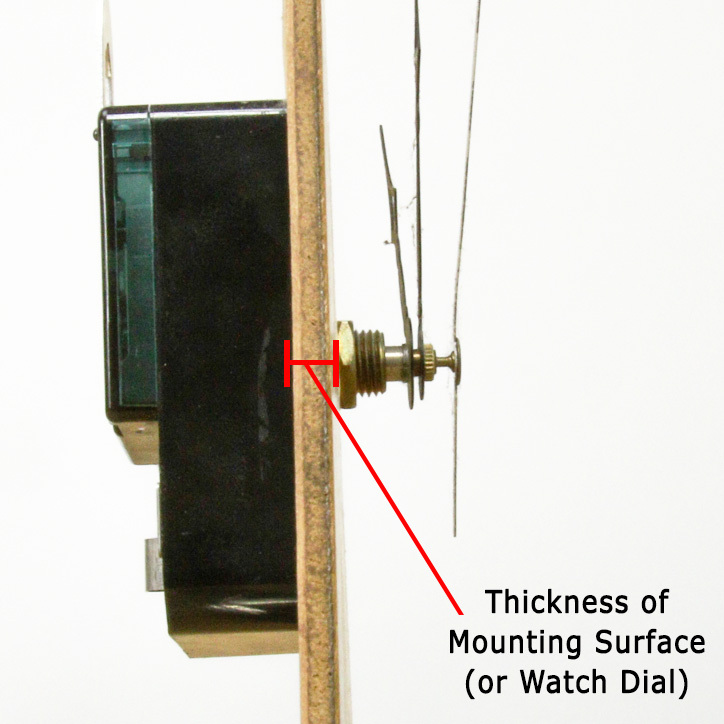 The post mounting hole of your clock dial (or mounting material) needs to have a large enough diameter to fit the shaft of the clock movement through it. 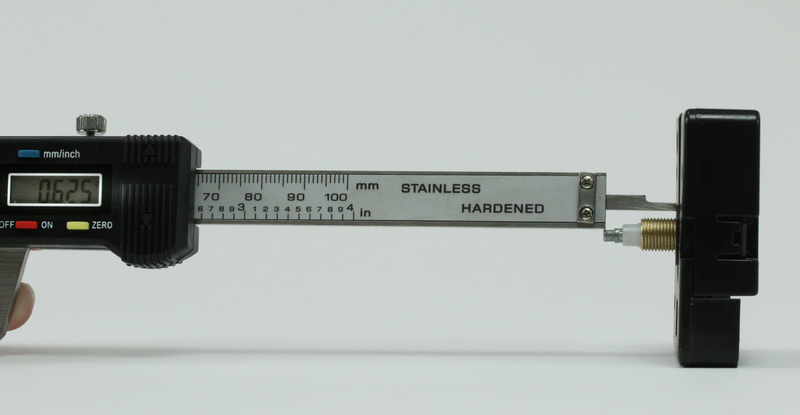 The easiest and most accurate way to measure the shaft length on a clock movement is to use the depth gauge on a digital caliper. 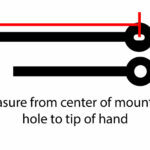 A ruler can also be used to measure the shaft length, if you do use a ruler to measure the shaft size make sure the ruler starts at 0, many rulers have their zero point a bit away from the end of the ruler. Once you have found your measuring device measure from the top of the post/shaft down to the movement housing. 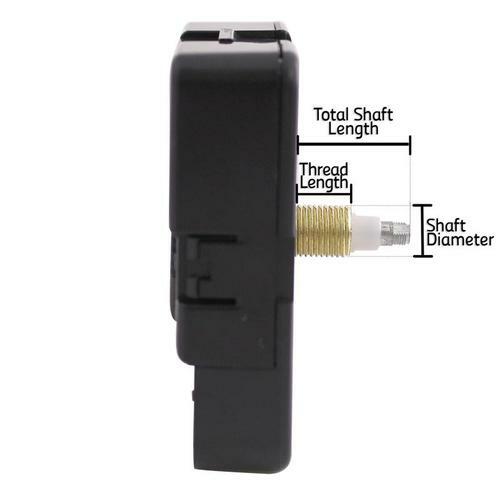 This will give you the movements total shaft length, which will be needed when ordering a replacement clock movement. If you are reusing your existing clock hands, you should confirm that the new movements shaft for both the hour and minute hand are the same size and shape as your existing hands mounting diameter. For an overview of quartz clock movement parts and assembly see our article Quartz Clock Parts and Assembly Diagram. I am trying to figure out what clock post length I need for a one inch thick wooden piece? That’s a tough one. 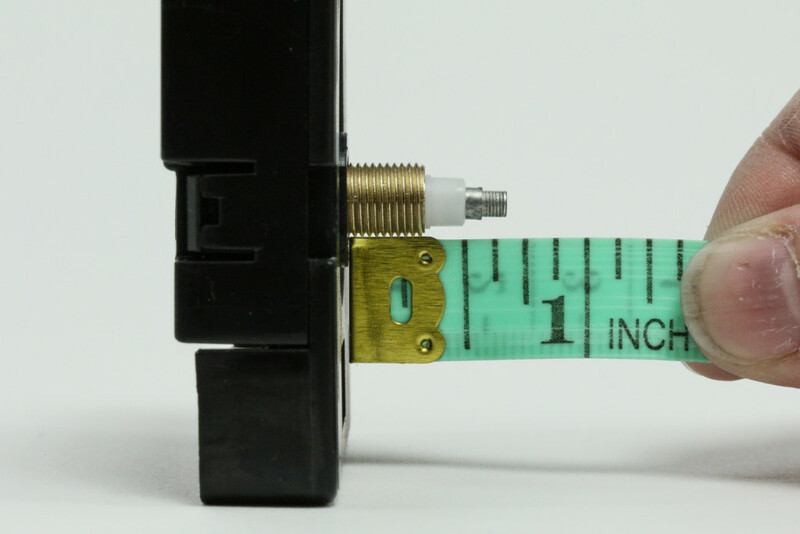 You would have to find a movement that has a really long shaft, and one where the threaded portion alone is at least 1 1/8″ (allowing for enough length to fit through the 1″ thick wood plus room left on the threaded area for the mounting hardware). Unfortunately most clock movements wouldn’t have long enough shafts to fit through something 1″ thick. Another less desirable option would be to cut out a “box” from the wood to fit the entire clock movement casing into, allowing the shaft to fit through a thinner area. I hope this helps! I have the same question. So there is nothing for materials that are an inch thick? So it wouldn’t be long enough to go through and inch of material and have somewhere for the nut to thread onto to hold the movement in place. The only other thing to try is to cut out a box from the dial material to make fit the movement shaft through the material. I have a Dual Chime Quartz Clock Movement with Removable Speaker and Pendulum in my clock which keeps good time but the pendulum only swings for about 10 minutes gradually losing amplitude. Do I need a complete new assembly or can I replace just part of it? What causes this problem? The magnet is good, the pendulum is free to swing and I have just replaced the C size battery? We bought a grandfather clock.it ran on c battery.that controled hands and played westminster chimes.do you have a replacement due to it not working.thank you. My clock dial is 1/2in thick what clock kit should I use. Using a wooden pallet to my a clock, thanks. Choose the threaded shaft length that is long enough to get through your dial material and will fit the nut to secure the movement. Movement # 74.482.5 should work for your purpose. Hi, I need to replace the quartz clock on my large clock (34cm minute hand, 19cm hour hand). The hands are very light tin but do I need a certain rating to run this clock? The previous mechanism (12888) seemed to drain the battery very quickly. Any help would be appreciated. Thanks, Andy. 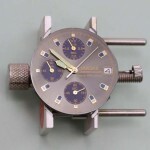 Please use the contact us form or email directly to brandons@esslinger.com for your question about the clock movement. What size clock mechanism would I use to make a clock from a vinyl record? Just measure the thickness of the record and order the threaded post length about 1/8″ to 1/4″ longer than the record is thick. I have a fairly standard looking small clock mechanism and I want to know the thread size and type so I can tap the a dial and screw the mechanism in flush and not have the spindle and nut sitting in front. The threaded brass section of spindle is approximately 5mm long and is 7.6mm diameter. It looks like 6 or 7 threads in 4.5 or 4.6 mm so calculating it looks like it would be roughly 0.64 to 0.77 pitch or 30 to 40 threads per inch. 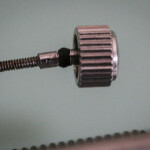 Are you able to give me any idea what the thread type, size and pitch would likely be so I can buy a tap to cut the correct thread in the dial? 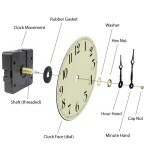 With regard to the Dual Chime Quartz Clock Movement, SKU 74.529, w/ removable speaker & pendulum & hands SKU 74.1335. Please confirm whether I have or have not settled on the right movement and hands to fit my clock. Based on your measurements, this clock movement will work as well as the hands you selected.